These days it seems it is getting harder for me to come across a food truck I haven't tried yet. While new restaurants seem to open and close on a constant basis in this town, new food trucks don't always appear quite so quickly. I mean, it is a lot of work and not always a lot of reward. Plus, you have to drive around in a large truck in the Bay Area which has some of the worst traffic in the world. But with my semi frequent trips to the food truck parks, odds are in my favor that on at least one of the visits, I may find one I haven't tried before. Such was the case with Cochinita on a recent trip to SOMA StrEatfood Park. It's Mayan cuisine, though when I stopped and thought about it, I was like, didn't their civilization die out thousands of years ago or something? It made me go back and read up on Mesoamerican civilizations. Fun times which you can Google on your own! Looking at their menu, which isn't extensive, it is minor variations on taqueria Mexican food, same foods different names kind of thing. Though they make all their tortillas, meats and toppings by hand as opposed to store bought so I'm sold. There are tacos and tortas and quesadillas but also salbute and panucho and vaporcitos. Plus a few subtle differences in preparation like slow cooking and banana leaves. In order to get the full range I landed on what they called the Super Traditional Combo. Yeah, at that price point it seemed high, but I was willing to give them a break because it was all hand made to order and what not. The combo includes a panucho, a salbute and a vaporcito. First up is the panucho--a handmade and fried corn tortilla stuffed with black beans and topped with chicken, cabbage, pickled red onions, tomato and avocado. This is not your standard taco and actually really can't be eaten by hand unless you are into getting messy. The tortilla is definitely thick and dough like as opposed to thin foldable ones. Nothing really wrong with that for this particular item which has a strong corn taste. The chicken is mixed with achiote to give it the red color but there is an ample amount of red pepper and spicy hotness going on in there too. The pickled onions help temper it a little plus give a sweet hot combo. The cabbage adds texture and crunch. It is a nice mix and at least a four bite tortilla with all that chicken and toppings on it. Next is a salbute--a puffy deep fried white corn tortilla also handmade. 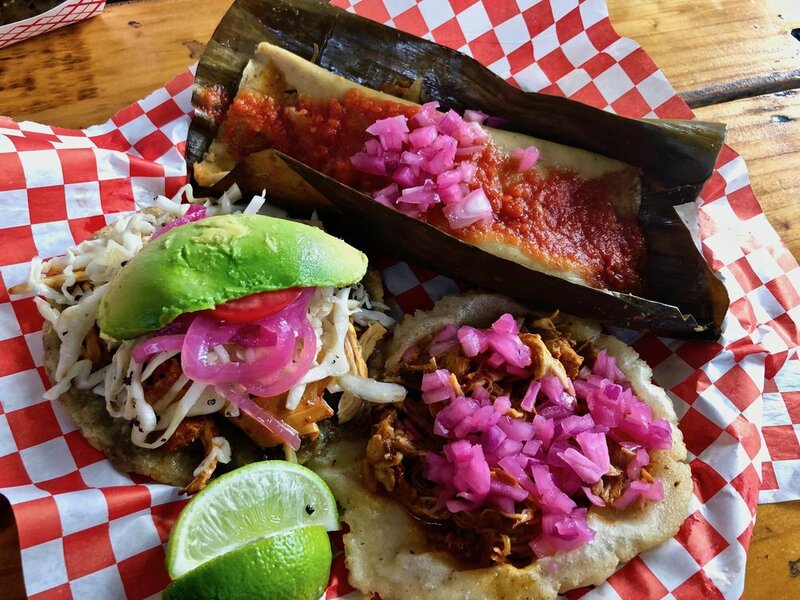 Without the beans this one puffs up like a crunchy shell and is then topped with pickled red onions and cochinita pibil--pork mixed also mixed with achiote, some citrus juices, then slow cooked in banana leaves. This you could pick up and eat though with all the wet pork, you need to eat fast before the juices seep through the tortilla. The meat has a real kick on this one also so you get the sweet hot combo again. It is a nice flavor profile, but to be honest, because of the same spice as above, had I been blind folded I wouldn't know which was the chicken and which was the pork. Not really a knock per se, but might have been interesting to have the flavor of the pork come through more. Finally was the vaporcito--a white corn tamale filled with a mix of the pork and chicken from above topped with salsa and pickled onions. I will say it is a big honking tamale! Not one of those small thingys you can hold in your hand. It comes wrapped in the banana leaf it is steamed in. I'm a sucker for a tamale in general as the soft corn texture and flavor remind me of a cross between polenta and grits, just in a soft solid form with meat inside. Again it is a mix of the meats from the other dishes and I did like the spicy flavor of it, but as with the other, might have been nice to have some variety with it. Maybe mix in a little cheese or something? Which, surprisingly, none of these had. Individually, I did like each of these offerings. I'm not sure I needed the three together since the meat filling made them all sort of blend together instead of fully standing out on their own. Might sound like a criticism but it really isn't as I would definitely eat at Cochinita again. Though I would settle on one of the items to enjoy as opposed to all of them. Which is why I won't pick any one of them as a favorite over the others. Best to just decide if you want soft corn tortilla, crunchy corn tortilla or tamale and just go with it. Either way, you can't really go wrong.